ETP Omni-channel Analytics is a retail business intelligence (BI) solution with powerful pre-configured, retail specific set of KPIs providing a 360° view of business processes for executives to analyze varied information, accrued daily. The solution methodology is based on global best practices for the omni-channel retail business model. It provides actionable insights about customer behavior across multiple retail channels, Merchandise Performance, Location Performance and Channel Performance across various buckets of time. 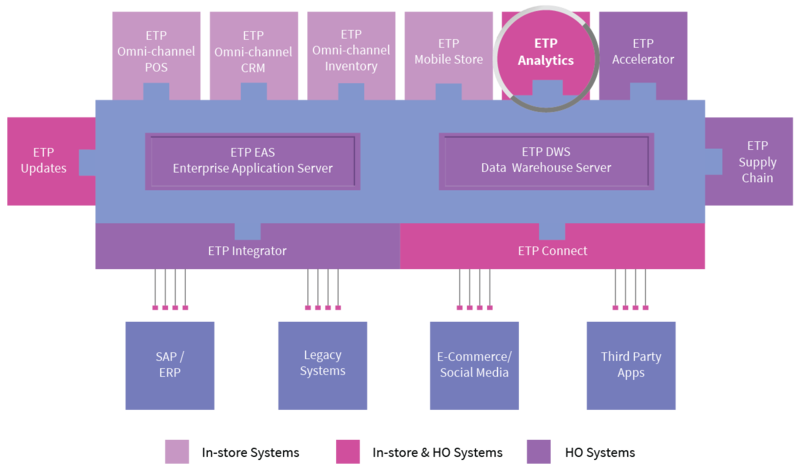 ETP Omni-channel Analytics is integrated with the ETP V5 data warehouse and gives retailers real-time access to data about stores, sales, customers, employees, inventory, merchandising, and more. This robust analytical engine obtains the necessary retail business intelligence that helps increase foot-falls, improve margins, volume size and supports business functions like promotions and pricelist optimization, demand forecasting, product assortment and customer segmentation.